India and especially the Himalayan belt have a rich heritage of traditional knowledge of medicine from plants.In the rustic setting in these areas each kitchen is a herbal kitchen. No meal is complete without one herb. With people migrating to urban areas, the knowledge passed down through centuries is being lost in the hustle bustle of city life. And more so because this folk traditional knowledge is disappearing due to non-availability of any documented records. These herbs are in huge demand for their use in medicinal properties in the pharmaceutical industry. This book is not about the cuisine of the Brahmaputra valley, it is about passing down and sharing what I inherited from my ancestors, through a photo journey. 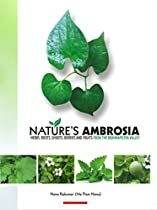 The book focuses more on recognizing the herbs, vegetables and fruits and is an exploration into their medicinal properties.